This women’s match between the US and Fiji followed on from the men’s match the previous afternoon where the two countries clashed in what turned out to be very heated. Fortunately while this match saw plenty of physical clashes, but things never looked like escalating to anything more than "in the contest" aggression. Andrea Casillas for the USA kicked the first goal of the match in the first few minutes. From here Fiji managed to lock down the ball around the ground with the Fiji captain Siteri Tadrau playing well on the defensive side of the many packs that formed. Matanisigadrau and Tuilevuka good for Fiji. The US added a second goal late in the quarter and Kastenak could have added a third but her kick went wide after a good leading mark. The highlight of the quarter for me was US onballer Blatnick’s blind turn around a Fiji defender and then spotting up the CHF with a crisp pass. Fiji managed just the one behind for the quarter and the US lead by two goals at quarter time. Meet the players - Luke Matias (Great Britain). Meet the players - Josese Natadra (Fiji). With the completion of Women's Round 5 the schedule for the playoff matches on Friday have been updated to include the Women's games. 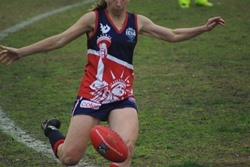 The Men's Grand Final Ireland versus Papua New Guinea will take place at 4.50pm at the MCG on Saturday (prior to Geelong vs Hawthorn), following on from the Women's Grand Final played at Punt Road from 2:10pm, Canada Northern Lights versus Ireland.